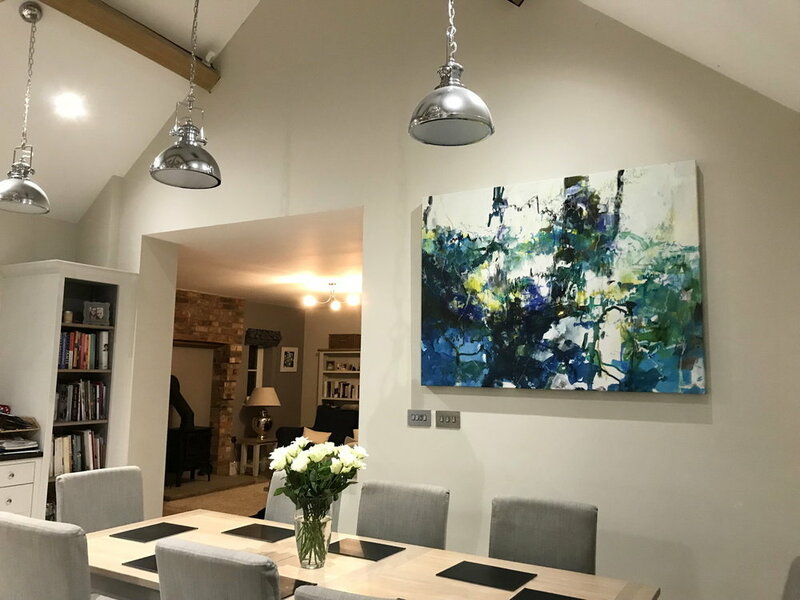 In March 2018, I was commissioned to do a painting for an empty wall in a new kitchen extension full of natural wood, and neutral pale greys and black. The clients have bought work from me before, but this would be for something on a much larger scale. The brief was for a bold, energetic, colourful abstract, with ‘wow’ factor. March 2018. Here we are on site. An old TV box came in handy for visualising the potential scale of painting needed to work in the space, more useful at first than a tape measure. March 2018. Part of an old orchard, seen from the house. Abstract trees are a significant part of the finished piece(s). March 2018. The clients chose a colour palette from my box of colour swatches. Pieces of coloured paper are the quick and easy way to do this. Some of the colours relate to the immediate environment, but other colours are added to fulfil the brief for a painting with a strong colour element. July 2018. One of the contenders for the commission (unfinished at this stage). It was painted during the heatwave this year, in heavily dappled sun and shade under trees. Birdsong was all around, and some of the marks are notations of the sounds I was hearing. My framers have put the loose canvas onto stretcher bars. I can get it in the car. But I can’t close the doors . . . The framers help me remove some seats, but still we can’t quite get it all in. So they let me store the painting with them while I come up with a plan to get it back to the studio. August 2018. 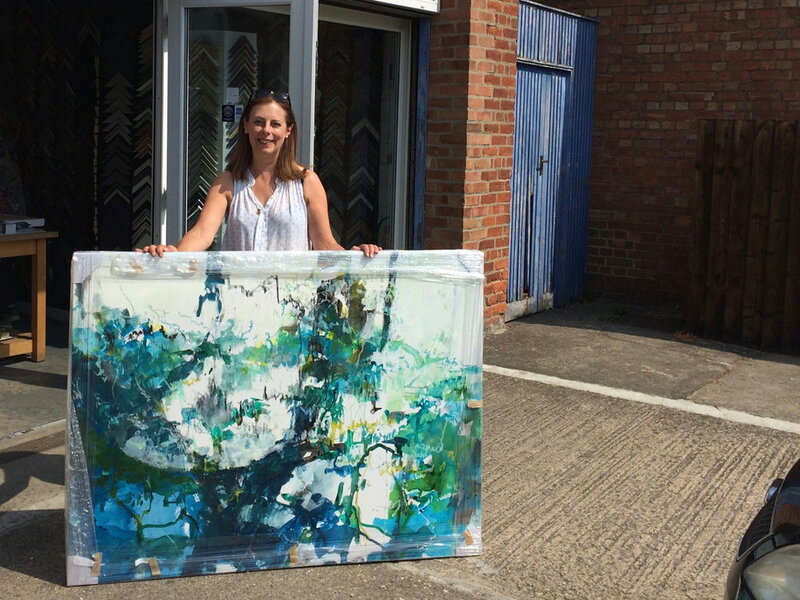 The painting and me travelling up Oxford High Street in a taxi. You wouldn’t believe how many taxi companies I phoned . . . but eventually I found a company with a mini-bus taxi large enough to take both the painting and me, and who were willing to do a short local run, rather than their usual airport transfers. November 2018. 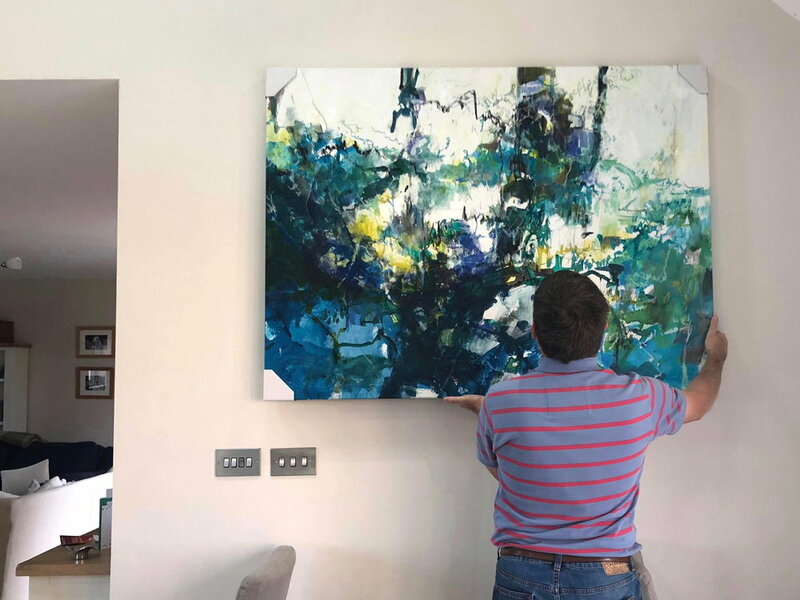 The clients’ car is fortunately big enough to collect the large painting, with a smaller one (to give a choice) tucked underneath. November 2018. When I say ‘smaller one’ I mean this one, waiting in the clients’ kitchen to be auditioned on the wall. Orchard (with a few things still to be finished) is acrylic on canvas, 100 x 100 cm. It turns out to be too small for the space designated for the commission, so not as useful for offering choice as I’d hoped. November 2018. However, we’d already spotted a potential home for it in the room beyond the kitchen. November 2018. 'Soundscape' up on the wall, to be lived with for a few weeks. Clients very pleased. Both paintings need a few small tweaks (clients' privilege with a commissioned painting) and there are a couple of small adjustments I want to make as well. But pausing and taking stock before making them is always a good move. Then varnishing will be the final step at the end of the year.